Size: 14 cm in length from the beak to the tip of the tail. Scarlet head, bordered with narrow black band, followed by a broad turquoise band. Throat and chin black. Breast deep purple, followed by golden-yellow. Neck, wings and tail green. Undertail coverts white. Black tail. Eyes brown, beak white with smudges of red, legs pink tinted. Also black-headed form (most common in wild) and yellow-headed form (rare). Female duller and bill charcoal during season. Finches are colony birds and prefer the company of other finches in an aviary environment. They can be very timid and generally do not form relationships with humans. Gouldian Finches are more friendly and inquisitive than other types and may perch on their owners once they are familiar with them. The Australian species make very little noise, apart from a quiet chittering. Protein-rich foods, vitamins, minerals, soaked and just-sprouted small seeds. Avoid white millet as this causes illness and even death among Goulds. Dry, warm (30°C) aviary at humidity of about 70 per cent. Gouldian finches love to fly and need a minimum of 50 cm of horizontal space to accommodate this natural behavior. They appreciate as big a flight zone, as you can give them. Although very social with their own species, in fact, needing this social interaction, finches do not like to interact very much with humans. 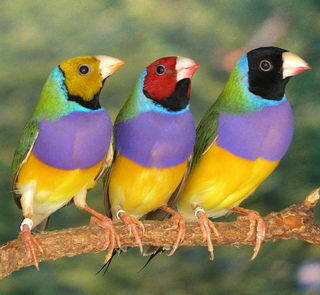 The Gouldian Finch is a Social bird. Hollow log or half-open nest box 15 X 15 X 25 cm, entrance 5 cm, which they line with dry or fresh grass, hay or coconut fibre. Don't furnish materials longer than 10 cm. Some pairs prolific, others need Bengalese as foster parents. Lay 3 to 8 eggs, incubation 14 to 16 days by both partners, fledging 21 to 24 days. First moult at 8 to 10 weeks, adult colours at 5 months.